William J. Murphy has a “calmness that exudes confidence and works exceptionally well in the courtroom,” as one client told Chambers USA. An experienced trial lawyer, Bill has tried civil and criminal cases to verdict in state and federal courts, represented clients in commercial arbitration, and argued numerous appeals in courts around the country. Bill has represented witnesses and targets of grand jury investigations, defended clients investigated by the SEC and other federal enforcement agencies, and represented individuals in congressional investigations—including several attorneys in the Office of the White House Counsel during the Clinton administration. Bill was inducted as a fellow of the American College of Trial Lawyers in 2002 and completed a two-year term as chair of that organization’s Maryland State Committee in 2014. He is currently serving a four-year term on the College’s governing Board of Regents. Bill has been entrusted by many local, regional, and national law firms with the defense of professional malpractice and breach of fiduciary duty claims filed against those firms. He also has been qualified as an expert witness in cases involving the standard of care and the ethical obligations of lawyers. Represented a former employee of Dewey LeBoeuf, the international law firm that failed in 2012, in connection with criminal charges filed against his young client for participating in an alleged scheme to defraud the law firm’s lenders. Our client was indicted along with three much more senior former employees of the firm by the New York County District Attorney’s Office. Pursuant to pre-trial motions our client’s trial was severed from the trial of his co-defendants. The Court later dismissed two of the seven charges on a defense motion, and the District Attorney voluntarily dismissed several other charges. Shortly before his case was scheduled to go to trial in March 2016, our client entered into a deferred prosecution agreement. Under the terms of the agreement, our client admitted no wrongdoing, and all remaining charges against him were dismissed with prejudice in January 2017. Engaged as lead counsel in the defense of lawyers at several regional and national law firms in separate actions filed by former clients of those firms, alleging claims of professional malpractice and breach of fiduciary duty. Over the course of his career, Bill often has been selected by prominent law firms and their insurers to handle sensitive litigation and other professional matters on behalf of those firms or individual attorneys. He recently settled a complex claim of professional malpractice for a law firm that had been alleged by a bankruptcy trustee to have contributed to the failure of the firm’s former client. Represented a law firm in a matter involving claims of malpractice resulting from the firm’s alleged failure to maintain its client’s foreign registration rights on a valuable manufacturing patent. The matter was settled on favorable terms without the need for litigation. Recently settled claims against a national law firm involving allegations of professional malpractice based on an alleged failure to perfect a timely appeal from an award of attorney’s fees entered as a separate judgment in employment litigation. Settled claims against another large national firm named as a party in protracted litigation involving claims totaling tens of millions in alleged damages, arising from the law firm’s representation of a target company in a private equity transaction. Obtained a favorable settlement and dismissal on behalf of a prominent group of outside directors in claims initiated by the litigation trustee appointed by the bankruptcy court for a national developer of senior living facilities. Following defense motions to transfer the case from the Northern District of Texas (where the bankruptcy was pending) to the District of Maryland, and before the court was able to rule on substantive motions to dismiss, the trustee agreed to present the case to a mediator. Represented the principal shareholders of a closely held government contractor in litigation initiated by a minority shareholder seeking dissolution of the corporation and related equitable relief. Following the successful defense of the case tried to a Maryland Circuit Court, we have continued as lead counsel in post-trial and appellate proceedings, two appeals, and proceedings on remand. Represented several individuals detained by the U.S. military at Guantanamo Bay and at Bagram Air Force Base. 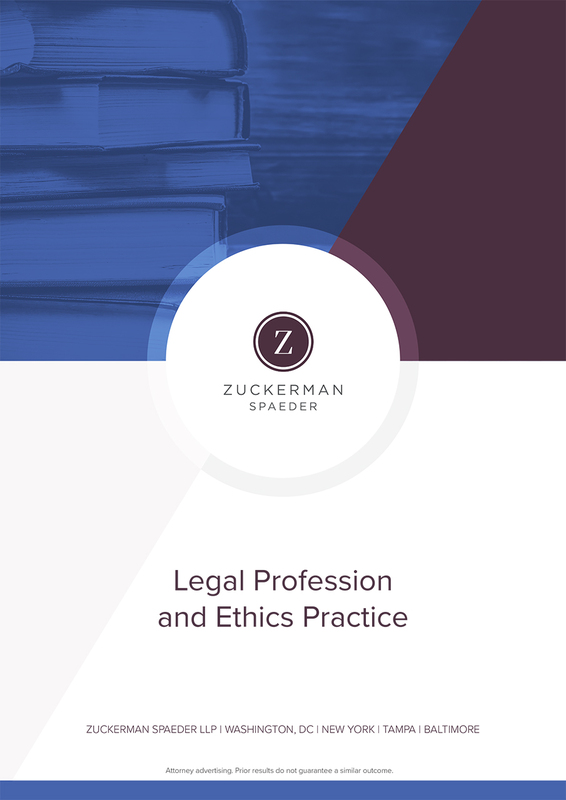 In December 2009, a Yemeni physician was repatriated to his home country following eight years of incarceration at Guantanamo, as a direct result of habeas proceedings and related litigation efforts pursued by Bill and other Zuckerman Spaeder attorneys. Settled a sharply contested litigation matter in which we represented corporate and individual investors in a dispute over the production and ownership of a long-form television documentary series for broadcast on public television. Represented a large retailer of wine and spirits in many regulatory and litigation matters including a successful federal antitrust challenge to Maryland wholesale price regulations in a case that involved four separate appeals to the U.S. Court of Appeals for the Fourth Circuit. We continue to counsel the client, and represent its interests, in litigation matters and with respect to state and federal regulatory issues in Maryland and numerous other states where the company has expanded its business. Represented several outside attorneys for Enron in U.S. Department of Justice Task Force proceedings, congressional hearings, regulatory matters, and private securities litigation that followed Enron’s collapse. Represented several attorneys in President Clinton’s Office of White House Counsel in congressional and independent counsel investigations arising from campaign finance matters, the Whitewater investigation, the Travel Office investigation, the Monica Lewinsky case, and the pardons issued by the president at the end of his second term.